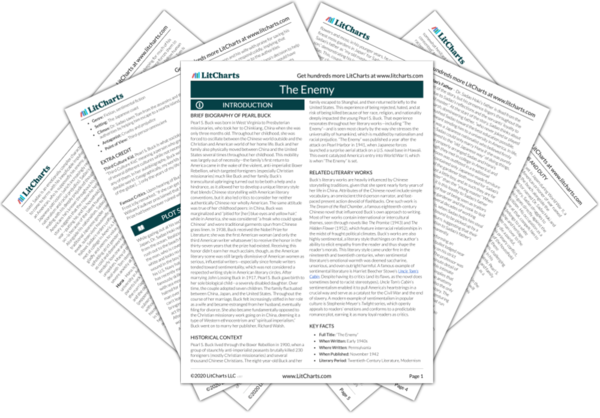 Instant downloads of all 946 LitChart PDFs (including The Enemy). 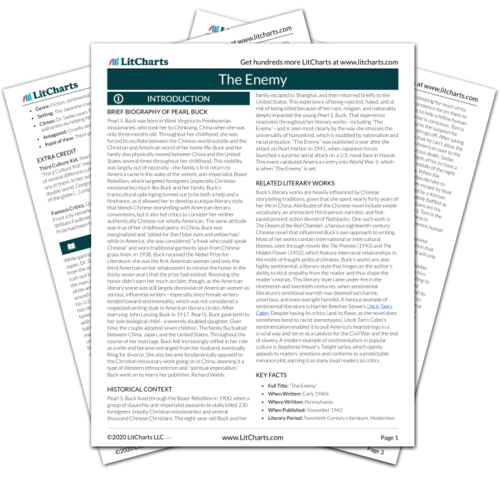 Welcome to the LitCharts study guide on Pearl Buck's The Enemy. Created by the original team behind SparkNotes, LitCharts are the world's best literature guides. A concise biography of Pearl Buck plus historical and literary context for The Enemy. A quick-reference summary: The Enemy on a single page. In-depth summary and analysis of every of The Enemy. Visual theme-tracking, too. Explanations, analysis, and visualizations of The Enemy's themes. The Enemy's important quotes, sortable by theme, character, or . Description, analysis, and timelines for The Enemy's characters. Explanations of The Enemy's symbols, and tracking of where they appear. An interactive data visualization of The Enemy's plot and themes. Pearl S. Buck was born in West Virginia to Presbyterian missionaries, who took her to Chinkiang, China when she was only three months old. Throughout her childhood, she was forced to oscillate between the Chinese world outside and the Christian and American world of her home life. Buck and her family also physically moved between China and the United States several times throughout her childhood. This mobility was largely out of necessity—the family’s first return to America came in the wake of the violent, anti-imperialist Boxer Rebellion, which targeted foreigners (especially Christian missionaries) much like Buck and her family. Buck’s transcultural upbringing turned out to be both a help and a hindrance, as it allowed her to develop a unique literary style that blends Chinese storytelling with American literary conventions, but it also led critics to consider her neither authentically Chinese nor wholly American. The same attitude was true of her childhood peers: in China, Buck was marginalized and “pitied for [her] blue eyes and yellow hair,” while in America, she was considered “a freak who could speak Chinese” and wore traditional garments spun from Chinese grass linen. In 1938, Buck received the Nobel Prize for Literature; she was the first American woman (and only the third American writer whatsoever) to receive the honor in the thirty-seven years that the prize had existed. Receiving this honor didn’t earn her much acclaim, though, as the American literary scene was still largely dismissive of American women as serious, influential writers—especially since female writers tended toward sentimentality, which was not considered a respected writing style in American literary circles. After marrying John Lossing Buck in 1917, Pearl S. Buck gave birth to her sole biological child—a severely disabled daughter. Over time, the couple adopted seven children. The family fluctuated between China, Japan, and the United States. Throughout the course of her marriage, Buck felt increasingly stifled in her role as a wife and became estranged from her husband, eventually filing for divorce. She also became fundamentally opposed to the Christian missionary work going on in China, deeming it a type of Western ethnocentrism and “spiritual imperialism.” Buck went on to marry her publisher, Richard Walsh. 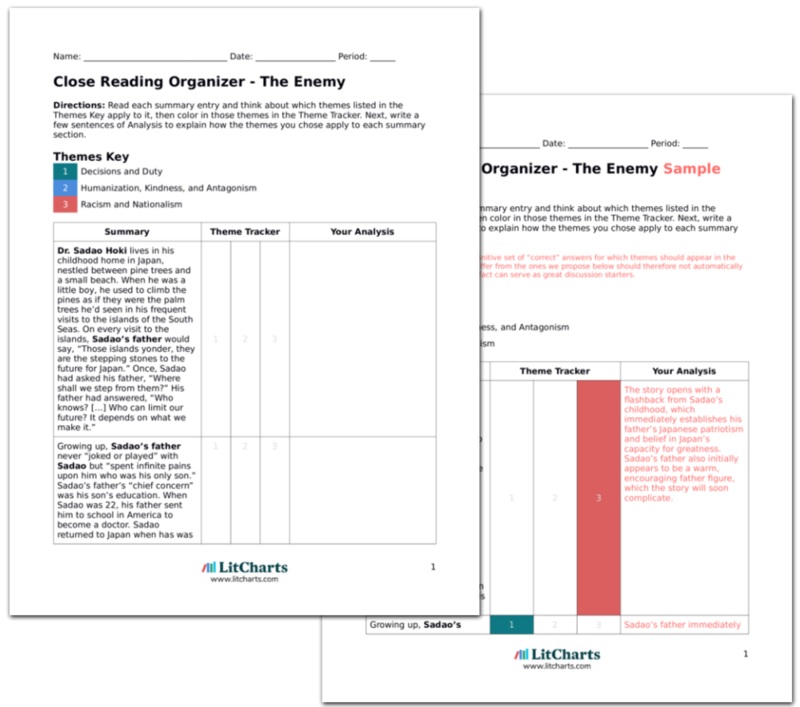 Get the entire The Enemy LitChart as a printable PDF. Pearl S. Buck lived through the Boxer Rebellion in 1900, when a group of staunchly anti-imperialist peasants brutally killed 230 foreigners (mostly Christian missionaries) and several thousand Chinese Christians. The eight-year-old Buck and her family escaped to Shanghai, and then returned briefly to the United States. This experience of being rejected, hated, and at risk of being killed because of her race, religion, and nationality deeply impacted the young Pearl S. Buck. That experience resonates throughout her literary works—including “The Enemy”—and is seen most clearly by the way she stresses the universality of humankind, which is muddled by nationalism and racial prejudice. “The Enemy” was published a year after the attack on Pearl Harbor in 1941, when Japanese forces launched a surprise aerial attack on a U.S. naval base in Hawaii. This event catalyzed America’s entry into World War II, which is when “The Enemy” is set. Buck’s literary works are heavily influenced by Chinese storytelling traditions, given that she spent nearly forty years of her life in China. Attributes of the Chinese novel include simple vocabulary, an omniscient third-person narrator, and fast-paced present action devoid of flashbacks. One such work is The Dream of the Red Chamber, a famous eighteenth-century Chinese novel that influenced Buck’s own approach to writing. Most of her works contain international or intercultural themes, seen through novels like The Promise (1943) and The Hidden Flower (1952), which feature interracial relationships in the midst of fraught political climates. Buck’s works are also highly sentimental, a literary style that hinges on the author’s ability to elicit empathy from the reader and thus shape the reader’s morals. This literary style came under fire in the nineteenth and twentieth centuries, when sentimental literature’s emotional warmth was deemed saccharine, unserious, and even outright harmful. A famous example of sentimental literature is Harriet Beecher Stowe’s Uncle Tom's Cabin. Despite having its critics (and its flaws, as the novel does sometimes bend to racist stereotypes), Uncle Tom’s Cabin’s sentimentalism enabled it to pull America’s heartstrings in a crucial way and serve as a catalyst for the Civil War and the end of slavery. A modern example of sentimentalism in popular culture is Stephenie Meyer’s Twlight series, which openly appeals to readers’ emotions and conforms to a predictable romance plot, earning it as many loyal readers as critics. Climax: Dr. Sadao saves Tom from the assassins and the authorities by helping him escape to a nearby island. Famous Critics. Upon hearing of Buck’s Novel Prize, Robert Frost icily remarked, “If she can get it, anybody can,” while William Faulkner proclaimed that the reputation of the Nobel Prize had been forever ruined with the choice of Pearl S. Buck. Weeks, Rachel. "The Enemy." LitCharts. LitCharts LLC, 29 Nov 2018. Web. 11 Dec 2018. Weeks, Rachel. "The Enemy." LitCharts LLC, November 29, 2018. Retrieved December 11, 2018. https://www.litcharts.com/lit/the-enemy.